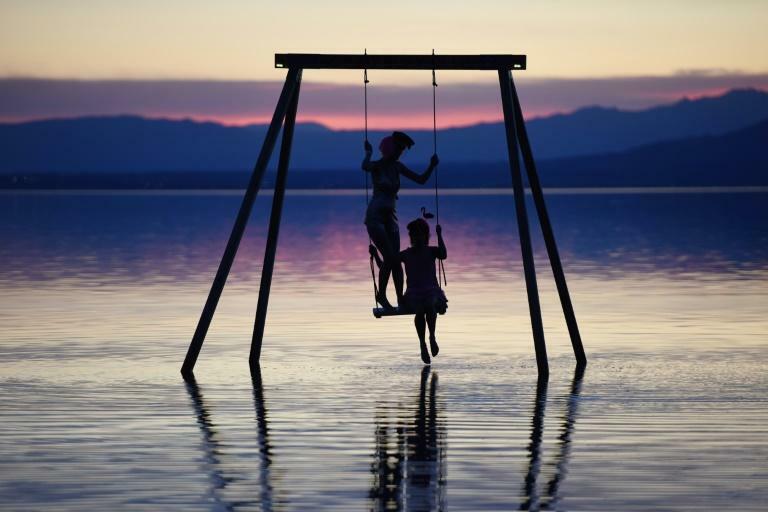 By any stretch of the imagination, Bombay Beach is an oddity, starting with its exotic name, its location by a dying lake and the post-apocalyptic landscape that greets visitors. The desert town, once a thriving resort set along the Salton Sea, is among the poorest communities in California, its 250 or so residents seemingly forgotten by the rest of the world. Most of the homes have been abandoned for decades, their yards filled with beat-up trailers and rusted cars. But the tiny hamlet is experiencing a rebirth of sorts as a group of artists and well-heeled sponsors have taken up residence, buying up dirt-cheap property and organizing an annual three-day festival called the Bombay Beach Biennale. Launched in 2016, the festival, which is being held this weekend, is the brainchild of three Los Angeles-based friends -- Tao Ruspoli, a filmmaker and artist, Stefan Ashkenazy, an art collector and hotelier, and Lily Johnson White, a philanthropist and member of the Johnson & Johnson family. 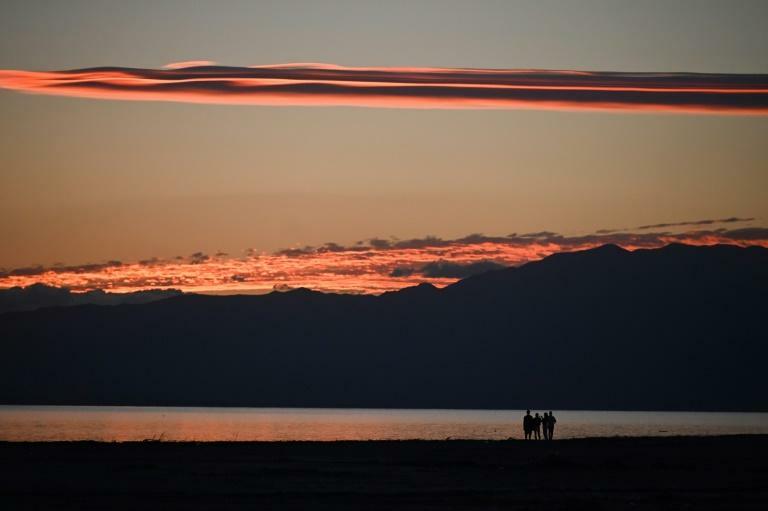 Ruspoli said he learned about the town about a decade ago after he stumbled on a book about the Salton Sea -- the largest lake in California, created in 1905 by an engineering error and now shrinking -- and was enthralled after a first visit. "It's mystifying and wonderful and weird," said Ruspoli, 43, who is the son of an Italian prince and was once married to actress Olivia Wilde. "It's so removed from the kind of homogeneity that exists in the rest of America where you have a Denny's and a gas station at every corner," he told AFP on a recent tour of the town. Ruspoli said he plunked down $20,000 for his first house in Bombay Beach in 2011 -- right after his divorce from Wilde -- and the idea for the offbeat festival took shape on a weekend trip there with Ashkenazy and White. The tiny town -- one square mile -- today boasts a museum called the "Hermitage," a drive-in movie theater filled with junkyard cars and an opera house decorated with disused flip-flops recovered from the beaches of Lagos, in Nigeria. Eccentric artworks -- a dome made of discarded metal, an aircraft fuselage representing a fish, a slide made of twisted iron rods and two shipping containers in the form of a cross with the inside painted with religious figures representing "persecuted scientists" -- make up some of the pieces on display at this year's festival. "If Andy Warhol were here today, this would be his thing," said Kathy Suder, one of the participating artists whose work features 100 white tents set up across an empty lot and representing the homeless and displaced. The draw of Bombay Beach, White said, was a space in which artists could be creative outside the boundaries of accepted conventions. "There is such a spirit of the misfit here and a little Peter Panism," she said. "We're inviting people to come and create and really manifest their dreams that they are not able to realize within the commercial art world." For Belgian photographer Kirsten Thys Van Den Audenaerde, who is taking part in this year's fest, there is no better place for someone to let their imagination run wild. "It's like a bomb has been dropped here and we're the last ones standing," she told AFP as she surveyed the surreal landscape. "Mad Max would feel at home here." Much of the artwork made for the festival is gifted to the town afterwards, a welcome distraction for most of the locals as well as the increasing number of puzzled-looking tourists driving through. To avoid hordes of people descending on the town during the festival, the dates of the event are kept secret. Attendance is by invitation only, with only about 500 tickets distributed to local residents, artists and financial sponsors. "We have no financial agenda, no merchandising, we don't take a dollar from this," Ashkenazy, who sponsors many of the artists at the fest, said. "This is more like a block party, it's not a spectator event." He said the ultimate goal is for the artists and sponsors to help the town get back on its feet and recover some of its faded glory. "It's important to note that the 'us and them' component is pretty much dissolved," he said. "We are all locals now and active participants in the community." That message appears to resonate well among longtime residents who say the festival is breathing life into a ghost town that once hosted the likes of Frank Sinatra and the Beach Boys but had become a backdrop for zombie movies and fashion shoots. "I have been coming here since the 1960s when you couldn't even find a place to park and when the marina was packed with boats," said Debi Cagle, 67, who owns a home in Bombay Beach. "It was absolutely amazing, the fishing was absolutely great and you had six bars across town." Dean McAfee, 77, who started coming to Bombay Beach as a child and who has now retired there, said while he may not connect with all the quirky artwork, the festival is a welcome change. "It's bringing the town back to life," he said. "And that's fine by me."